Don Heffner was a professional baseball player, coach and manager, and played for the New York Yankees in the 1930s. 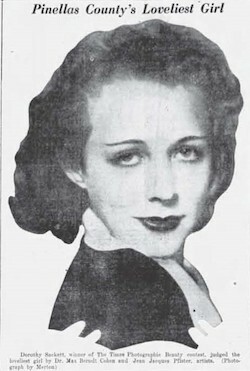 In December 1932 Dorothy won a photographic beauty contest and was named loveliest girl in Pinellas County, Florida. 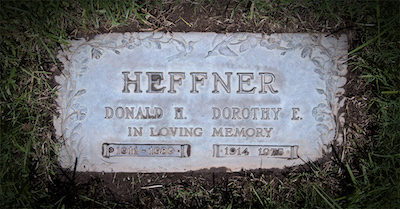 "California, Death Index, 1940–1997", database, Ancestry.com, "Heffner, Dorothy E, b. Ohio, 26 Jan 1914, d. Los Angeles, 18 Nov 1975." Hill, Valvoria, mother-in-law, 61, wd, b. OH, father b. OH, mother b. OH. "US School Yearbooks, 1880–2013", digital image, Ancestry.com, St Petersburg High School, 1930, "Sackett, Dorothy." "US City Directories, 1822-1995", digital image, Ancestry.com, St Petersburg Directory, Florida, 1933, "Sackett Dorothy E r696 33d av N."; 1934, "Sackett Dorothy E cash Child's Pharmacy r4643 16th av S."; 1935, "Sackett Dorothy E cash r696 33d av N."